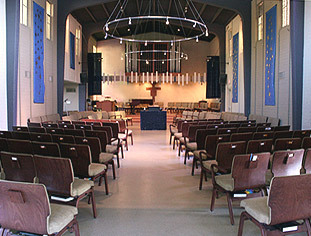 Wedding chapel available for weddings, commitment ceremonies, and vow-renewals. Organ or Grand Piano available. For your convenience, complete packages available (florist, sound tech, organist/pianist, and minister included). Please call for further information or to schedule a tour of the chapel. Appointments are available days, evenings, and Saturdays. Let us know how we can help on your special day! Worship with us at 10am on Sunday mornings! We are called to be a welcoming, nurturing, community of faith, gathered to celebrate and share God’s love. Empowered by the Spirit of God, we struggle to live the teachings of Jesus Christ in our broken world, seeking joy and justice for all creation.